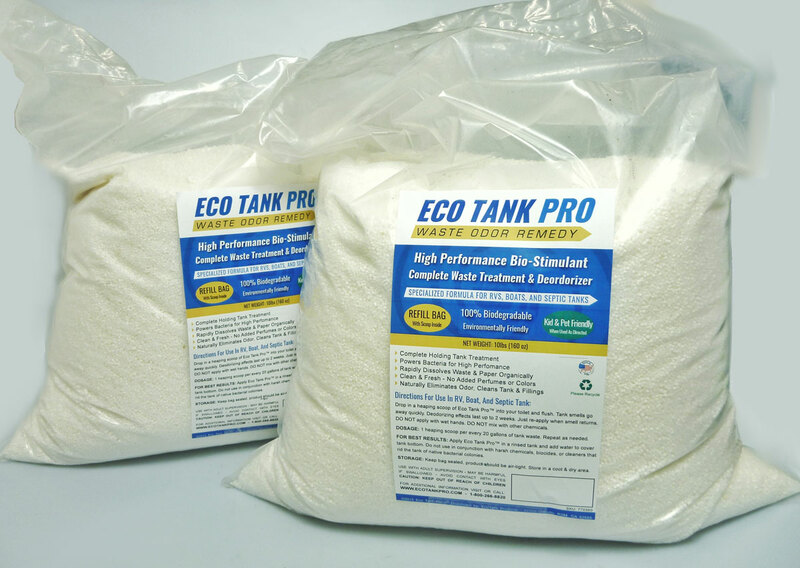 Eco Tank Pro™ provides a powerful all-natural deodorizer and waste treatment. It's simple to use and environmentally friendly, and is the perfect solution for eliminating unpleasant odors in RVs, trailers, powerboats, sailboats, and in your home. Actively stopping the production of odor, Eco Tank Pro™ reduces surface and bottom solids in the holding tank and septic tank. No staining, no odors - Eco Tank Pro contains no obnoxious chemical perfumes. It’s all-natural and all-clean! Exceptional product development and scientific research guarantees that our products will remove foul smelling odors without any harsh chemicals. 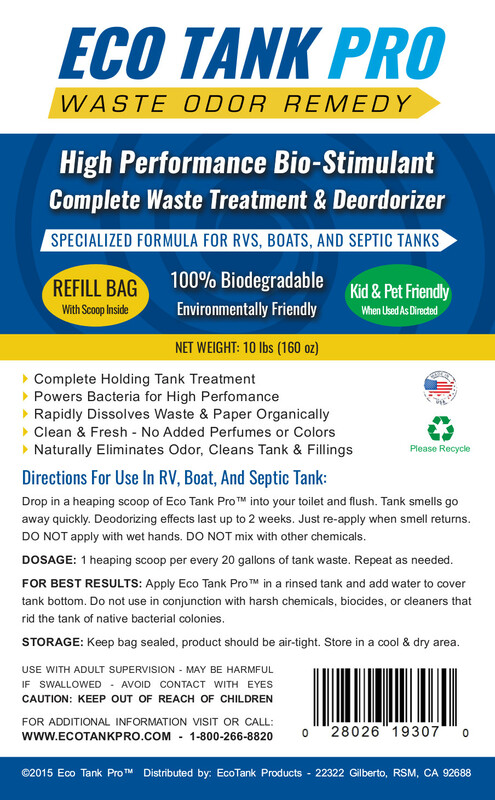 DIRECTIONS FOR USE IN RV, BOAT, AND SEPTIC TANK: Drop in a heaping scoop of Eco Tank Pro™ into your toilet and flush. Keep bag tightly sealed after use. Tank smell should go away quickly. Deodorizing effects should last up to 2 weeks, if not, you may increase the dosage. Just re-apply when smell returns. DO NOT apply with wet hands. DO NOT mix with other chemicals. DOSAGE: 1 heaping scoop per every 20 gallons of tank waste. Repeat as needed. FOR BEST RESULTS: Apply Eco Tank Pro™ on a newly rinsed-out tank and add water to cover tank bottom. Do not use in conjunction with harsh chemicals, biocides, and cleaners that rid the tank of native bacterial colonies. STORAGE: Keep bag tightly sealed, product should be air-tight. Store in a cool and dry area.